Cutting their teeth on the streets of Downtown Colorado Springs for the past three years, the Tejon Street Corner Thieves have self-defined their project as an “outlaw-trashgrass four piece.” If you’re not sure what this exactly means, rest assured, neither do we. But the people who have taken the time to find out seem to be pleased. Taking home the 2015 Gazette “Best of the Springs” award, the 2017 Pikes Peak Arts Council “Best In Show” and receiving 14,666 views on YouTube for their Garden of the Gods “Whisky” performance are just some of the bands past achievements. 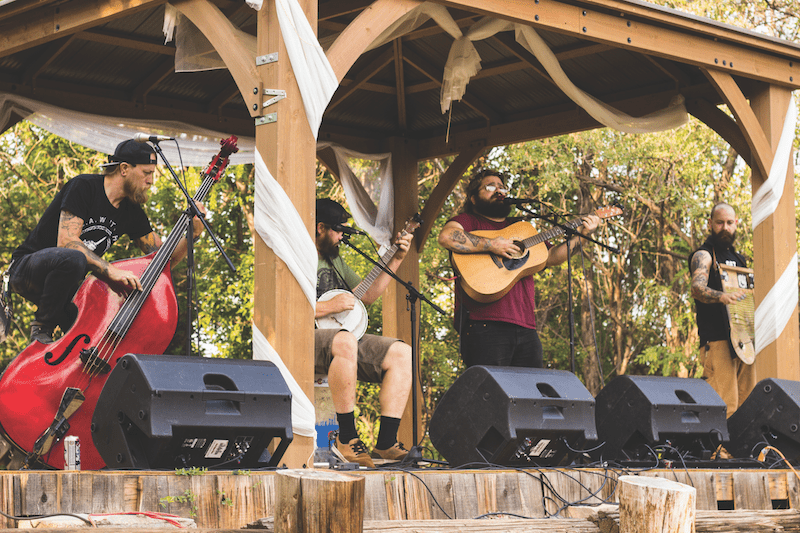 Blending deep soulful lyrics with melodic banjo, the Colorado Springs-based band creates rowdy bluegrass anthems about cheap whiskey and comfortable bars. Releasing their second album “Goers” in 2017, Tejon Street Corner Thieves are gearing up for a handful of Colorado Springs gigs. Graciously accepting an interview with us, TSCT talk about what it’s like being a label-less band, top five places to play music in Colorado Springs and their homemade TSCT Hot Sauce. How did TSCT band originally form? My dad passed away in December of 2012, so I moved home from New Orleans to take care of my mom. It was a tough time to say the least but open mics and busking got me through it. I met Shawn through a mutual friend and we clicked. He had lost his dad soon before I did. So we were both kinda on our own. It inspired us though. We just did music full time and have ever since. How long have you been playing music in Colorado Springs? The band is about 5 and a half years old. We’ve been touring nationally for about 3 years though. I saw that you guys have some homemade Tejon Street Corner Thieves’ hot sauce on your Facebook page. How did this come about? Shawn has been making it from scratch! And we eat hot sauce on pretty much everything because food on the road is typically awful. It makes gas station burritos not so bad. It’s nice to have around! Tell me about the band’s new school bus? Is this going to be used for touring? Yup! That’s the plan. Our RV’s transmission blew up in Kansas City in February so we’ve been touring in a van. We’re putting bunks in the bus so we can rest on the road and save money on hotels. Exhaustion is one of your biggest enemies on tour. What is it like to be a part of the Colorado Springs music scene? There are really great things about the community here, but it can be tough too. There are so many places that bands can play! But it’s a tough industry everywhere and you have to be a jack of trades to be successful. But the Springs has all the tools you need to get a start. I heard your song “Goers” is about the band’s favorite bar in the country. What bar is it? And what is it like? The bar is called the Westport Saloon in Kansas City. 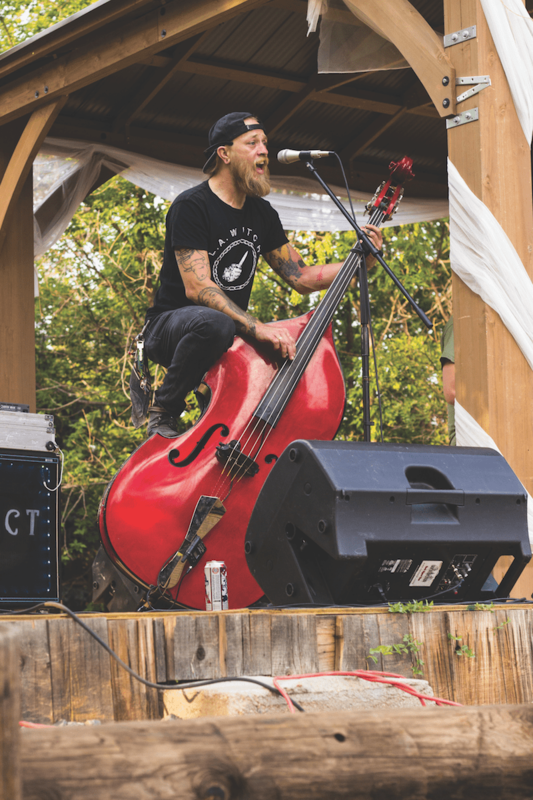 They have free live roots music every night, cheap drinks and even throw their own weekend long festival once a year. And it is awesome. The friends and connections we’ve made playing there are invaluable! And their love and support of the roots scene is almost unmatched. Go there and be a Goer too! What are your favorite venues to play in Colorado Springs? Triple Nickel Tavern, The Black Sheep, Oscar Blues, Mother Muffs and Jack Quinn’s are probably out top 5. It seems like more and more bands these days prefer to stray away from records labels. Is this an intentional decision for you guys to be an independent band? The two offers we’ve had to sign haven’t been good. They basically wanted to get 2-4 albums out of us and then have us owe them money. I’m sure there are better labels out there. And I’m certainly open for negotiation. We could use some help, but don’t necessarily need it. We’ve been more successful each year and I don’t see the trend slowing down. And we owe it to our D.I.Y. ethics. Describe the genre Trashgrass for me. We call it that because we never know how to describe our sound. The best way to find out is to come to one of our shows! What is the TSCT drink of choice while on the road? Water and coffee. Haha. A lot of Jim Beam and PBR too. Keep at it! We’re recording a live album in October at Western Jubilee. Then re-releasing “Every Last Drop” on vinyl by the end of the year. We’re starting to book into next year and I know it’ll be our biggest year yet. 2020 we’re shooting for Europe and beyond. Anything else you would like to share about your band? Check us out on your favorite platform! You can find us just about everywhere including Facebook, Spotify, AMI Jukeboxes, iTunes, YouTube and even on the radio here in town at Mountain Country 107.3!